Looking for something to make that will warm you inside and out? 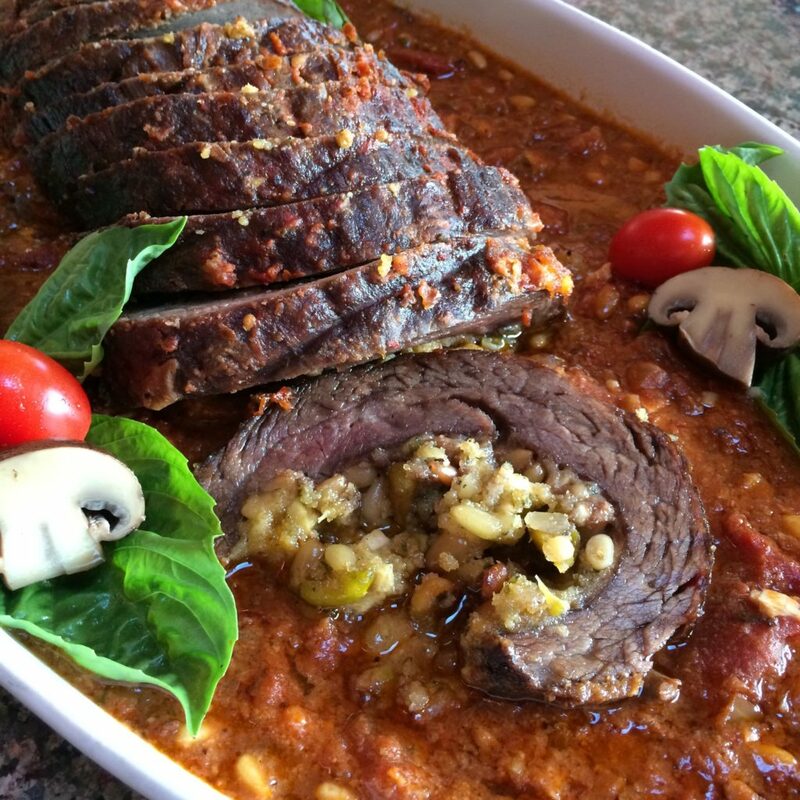 Try this rolled stuffed flank steak, aka braciole. This recipe for rolled stuffed flank steak is so flavorful it will become a favorite before you know it. As a bit of a joke I brought this rolled stuffed flank steak to a Christmas cookie gathering that FBLA held recently. I made a lovely savory vegetarian yule log but was looking for something a bit hardier…but ‘log-ish’. I immediately thought of braciole. Then paused because I had never actually made braciole. I found my inspiration on Nicole Gaffney’s site Coley Cooks. What stopped me dead in my tracks was how absolutely beautiful her rolled stuffed flank steak looked. After I read her recipe I was hooked. Of course, I had to put my own personal touch on her recipe. I added grated aged provolone, swapped out the raisins with crispy apples…and I might have upped the amount of pine nuts…and garlic. The result was very well received and devoured in minutes. In fact, as I was cleaning up, Erika of In Erika’s Kitchen asked if she could have the sauce. Yeah, it was that good. I think the reason the sauce was so very tasty was that I added the leftover stuffing to it, which added an extra layer of flavor and thickened it up. Place breadcrumbs, cheese, white wine, basil and garlic in a bowl and mix thoroughly. Toss in apples and pine nuts. If the stuffing is too dry add a splash of olive oil. It should be moist but crumbly. Cut 4 or five pieces of butcher's twine or string of some sort to about 12 inches long. Place the strings vertically about two inches apart on a cutting board. Place flank steak on the strings with the short side of the steak facing you. Place stuffing on the steak. 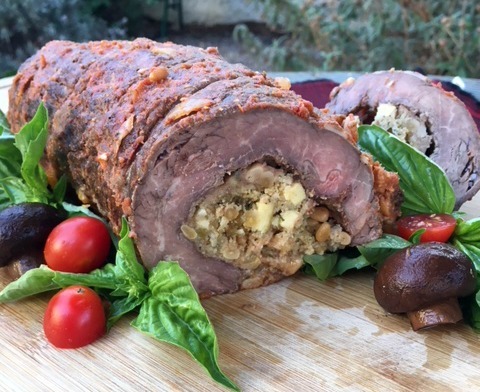 Roll steak over stuffing. Some will fall out. You will add that to the sauce later. Tie strings around steak to secure it. Heat a large pot that has a lid like a dutch oven. When hot add olive oil and place rolled steak in pot. Sear on all sides. Once browned remove from pot. Splash a bit more olive oil if needed into bottom of the pot. Add onions and garlic and lower heat a bit. Cook for about 2 minutes until the onion and garlic soften a bit. Add white wine. Bring to boil. Add tomatoes bring to boil. Add rolled steak and splash some sauce over the meat. Reduce heat and cover. Cook for 2-3 hours at a low simmer turning meat every half hour. This was so yummy. Want to make this on a nice winter day! I have always loved flank steak, which once upon a time was a very inexpensive beef that only a relative few people knew about. My mom used to marinate it in teriyaki sauce, then toss it on the broiler. Damn, that was good. But that was about the only way I knew of to prepare it. But now, thanks to you Judy, I have another way to prep and serve it. I cannot wait to try your recipe. Many thanks! Greg, you should have BEEN THERE! It was so amazing! We pounced on it and we reduced it to rubble in minutes. I LOVED THIS DISH JUDY! hands down one of the best meat dishes I’ve ever tasted. each separate part was amazing — the stuffing, the meat, and the sauce, which I could have just filled a bowl with and eaten it like soup. This is another genious recipe! The flavors, the aroma, the colors, well just everything about this dish is perfection.